Jaclynn Knutson grew up on her family’s farm in Turner County, South Dakota, and, as far back as she remembers, she helped with the farm and hog operations. Currently a senior at South Dakota State University, Jaclynn is a three-time Niman Ranch Next Generation Scholarship Award Winner and will graduate from SDSU debt free. Truly one of the leaders of the next generation of American family farmers, she likes to refer to herself as a production agriculturist, as opposed to a farmer. We caught up with Jaclynn recently to talk about growing up on a hog farm, Niman Ranch’s standards, and what’s next for a seventh generation South Dakota farmer. ButcherBox: Can you talk about your family’s ranch? Jaclynn Knutson: The Knutson Farm, our family farm, is near Centerville, South Dakota. I am actually a seventh-generation agriculturalist; my family has been raising crops and livestock for a very long time in that area. This is where we homesteaded and where we stuck around. The piece of ground that my great-great-great-great grandfather homesteaded isn’t in my direct family anymore, though it is still in the intermediate part of the family. My parents don’t farm the original land, but they’ve had their own piece of ground passed down to them. I’m the oldest of four girls, and my sisters and I bought 60 acres and we are the fifth generation to be farming that ground. And that’s a cool thing to be able to say that. Jaclynn: I like to say I was literally born in a barn and behind the seat of the tractor. My parents were really young when they had me, so, at that time, they were just starting the farm. So I just became a part of life on the farm; I lived in the barn when they were working there and I’d ride along in the tractor. My first memories, especially with the hogs, were during the farrowing season, getting to go out with my mud boots on and wander around and look at all the new baby pigs. That was always fun. During that time, my sisters and I would make sure that the pigs had plenty of bedding and that we were meeting those Niman Ranch standards. 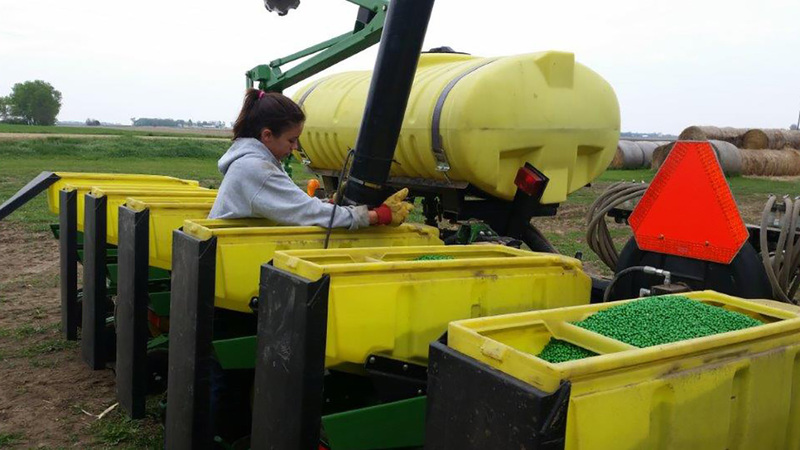 Jaclynn filling the farm’s bean planter. BB: Your family has been raising hogs humanely for a long time now, can you talk about the importance of running a family farm with high ethical standards? Jaclynn: Going way back, my family has been raising our hogs the Niman way. My Dad decided to take over the operation when my parents came back to the farm after they got out of college. Then around 16 or 17 years ago, they got hooked up with Niman Ranch and realized that what we were already doing on our ranch lines up with the Niman standards. It was great for us to be able to get a company who really appreciates what we do as a family and how we treat our animals. BB: Can you talk about how your family is working to run its hog farm sustainably? Jaclynn: We do different sustainable agriculture practices. For instance, we do conservation tillage and no-tillage. Cover crops are big, as is having animals graze our land, putting the animal nutrients back into our ground. BB: When did you first become aware of a difference between the way your family farm raised hogs and conventional pig farmers? Jaclynn: To be honest, my family has been raising hogs the same way forever. So, I really didn’t understand how big of a difference it was. But by my senior year in high school, I started to realize the difference between how we raise our hogs and how other people raise their animals. During my freshman year of college, I got to go to the Niman Ranch Hog Farmer Appreciation Dinner for the first time and mingled with people who actually used our products. There, I realized how much people appreciate how we raise our animals. I had never gotten the chance to do that before. It was really neat to meet with people who actually appreciate what we do instead of folks who I’d previously met who have negative opinions of hog farmers. That was the first time that I really got to see how special our product is and how much people appreciate it. BB: So what have been some of the biggest challenges you’ve discovered helping run a family farm? Jaclynn: I would say the biggest challenge overall is just financial. With agriculture as a whole, you can’t make the wheel turn if there is no money behind it to support it. This is especially true for young farmers, like me. The startup costs to begin a new operation are large. If you plan to graduate from college and start right away on the farm, that’s financially really hard to do. That’s another thing that my family appreciates about Niman as well – they see the value in what we do, so they make sure we get the value back that we deserve for how we treat our animals. I think that alone is really important. BB: And so what are you doing right now? Jaclynn: I’m an agricultural communications major at SDSU right now. I actually came into college as an animal science major because I thought I wanted to learn about animals. But after a couple of animal science classes, I realized that while I really like agriculture, I wanted to learn how to communicate that passion to others. There are too many people in this world that don’t understand agriculture — in particular, where their food comes from and what farmers and people around agriculture are doing to make food available to more people here and in other growing parts of the world. So, that’s what I’m passionate about now; It’s great being able to just have conversations with people and talk to them about what my family is doing to put food on their plate. BB: And, after school, are you going to be heading back to the farm? Jaclynn: Because my parents were really young when they had me, there really isn’t room on the farm yet for me. Also, there is the financial part. So, my plan is to find a career where I can communicate about agriculture for a number of years. I’ve been building my part on the farm for a while, but it’s still not big enough. When the time comes, I plan to return to the farm. But I also love to travel, and Niman’s given me some pretty cool traveling opportunities to speak about the company to different people. That has also really helped me to develop a passion for what they do and help people understand what my family does on our farm. BB: What would you like to help more people understand about family farms? Jaclynn: In general, people don’t appreciate where their food comes from. And not only where their food comes from, but what is happening to their food before it gets to their plate. I think people can gain more appreciation for things that our farm and organizations like Niman do.